In this day and age, it seems very easy to let cynicism rule our lives, but occasionally we get a reminder that human nature can be so much better. BBC News has reported the case of 72 year-old Jim Webb from Sheffield, who in 1969 had a chance encounter with Australian tourist Gary Fenton in Ostend, Belgium. Fenton couldn't afford the ferry fare to return to England, so Webb lent him £5. Although he promised to repay the money, Webb never heard from him again until last Sunday when, while he was out, Fenton hand-delivered a card and £200 to his home. The card said he was repaying the £5, plus the same again for every year of the debt. Another way of looking at it was that he repaid the original loan with 9.92% annual compound interest. Webb has said he will be donating the full £200 to charity. The earliest appearances I have - although I'm sure it's not the actual earliest (there must have been a fair few previously) - I only "rediscovered" recently in an unedited-out advert break in the middle of a documentary I recorded in 1992, back in 4:3 Screen-Ratio Land. It features a commuter whose cold is so bad that he grows a giraffe's neck and an elephant's nose, which he then uses to retrieve some Halls Mentho-Lyptus lozenges from a platform newagents. While it appears to have been shot on a very good mock-up of a sub-surface line car, with exterior back-projection, it seems a real train was used for the platform shots, although it's not possible to idetify the station used. Fast-forward to 2006, and we saw an alien being welcomed to Britain with a pack of Wrigley's Airwaves Active chewing gum. With the tag-line of "back to normal," he is then seen doing all manner of British activies, such as queuing, waiting to be served in a dingy greasy spoon café, and - of course - being crammed like a sardine into a Tube train. 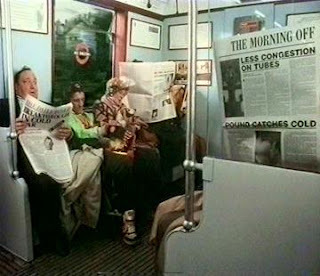 An advert later the same year featured a rather novel solution to train overcrowding, as a man wanting to board drops a Kellog's Crunchey Nut bar, which most people in the car then leap out to try to "claim," leaving them in a jumbled heap on the platform. This was shot at the disused Jubilee line platforms at Charing Cross, with the station name being clearly visible in several shots. Lastly, and still in 2006, The Times purported itself to be so interesting that commuters would go to even more determined lengths than usual to read a copy over someone's shoulder, even down escalators, and from outside the train! 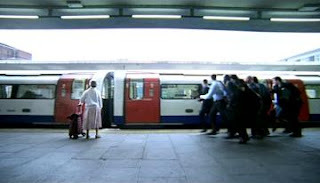 Shot on the Northern Line, and featuring East Finchley station. While Claire and I were on our honeymoon in Malta (really must get round to saying something about that! ), a rather random conversation led to discussion of Israeli nuclear whistleblower Mordecai Vanunu, so after we got back I dug out my off-air VHS of Secret Weapon, TVS's 23/12/90 dramatisation of his pursuit, kidnapping, and trial. It had probably been at least seven years since I'd watched it (certainly not since I moved to London), so I was a bit surprised at the appearance of a segment involving the London Underground that I'd not previously documented. 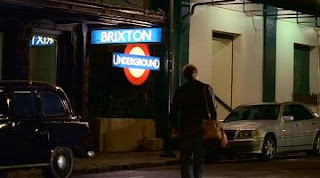 In the sequence, Vanunu's associate Felix Romero (Joe Petruzzi) is followed by MOSSAD agents into the real Russell Square Piccadilly line station, and is then seen descending some escalators, which is rather remarkable, given that the station does not have any (rather it is served by lifts)! Felix is then followed onto the platform, actually shot on the one at Aldwych. He boards a train, inadvertently tries to chat up the female MOSSAD agent who has been tailing him, and then follows her off at Liverpool Street, although it's actually the platform at Aldwych again. 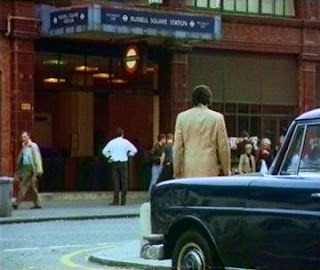 There then follows a scene shot outside the real Liverpool Street. Overall, a fairly effective sequence, but for the gross error with the escalators. A recent fictional spy story, however, took an even more liberal view of London's subterranean architecture. I don't usually watch Spooks, but Claire's sister tipped me off about the last episode of the latest series (08/12/08), and I managed to initially catch it again on BBC iPlayer, and then last night's repeat. 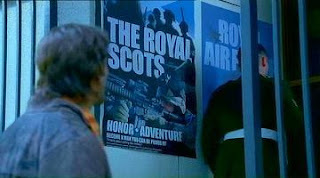 In the episode, two MI5 officers and a traitor are being pursued by Russian assassins, so they decide to make an underground detour. Coincidentally this involves Liverpool Street again, where it seems that there is a disused branch that can take them all the way to London bridge without coming to the surface again! Following scenes shot on the real Liverpool Street mainline station concourse, those set underground were actually shot in non-public areas at Holborn, including the disused Platform 5, formerly serving the short branch to Aldwych. In certain shots filmed from inside the tunnel at the Aldwych end of the platform, trains could be seen at the opposite end crossing the junction with the main Piccadilly line, heading north/east towards Cockfosters. A trackside line diagram was briefly visible, showing a vertical line from which a loop branches off to the left, before rejoining in a reverse direction. 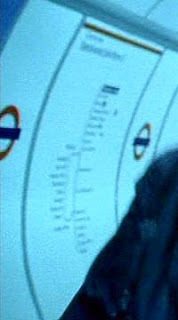 The number and arrangement of the visible station names exactly matches the eastern end of the Central line, but "this station" at the top would be Chancery Lane, not Liverpool Street (which would actually be the third one down). As the chase continues, the MI5 agents find an train abandoned in the tunnel, complete with resident aggressive female tramp (who later gets shot by the Russians - a rather extreme answer to the problem of homelessness). Subsequently, the pursuit leads to what clearly there had been no attempt to disguise as the disused Jubilee line platforms at Charing Cross, as well as some of its associated cross-passageways, before eventually ending up at London Bridge. An exceptionally circuitous route! 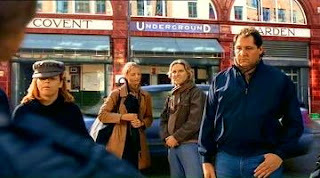 Other London Underground-connected scenes in the episode were senior MI5 officer Harry Pearce (Peter Firth) disposing of a Russian agent in one of the Hyde Park Corner subways, and a former KGB sleeper agent going into the Underground entrance on the Waterloo mainline station concourse, en route to detonating a briefcase nuclear bomb in front of the American embassy in Grosvenor Square. Stretching credibility even further was the latter's device - after he is killed - being brought to London Bridge in time for it to be defused in less than 20 minutes! 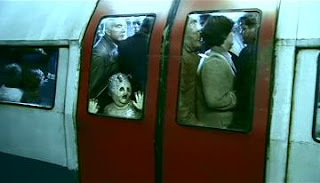 Slightly more convincing have been a few random Tube scenes in some of our other recent vintage viewing. 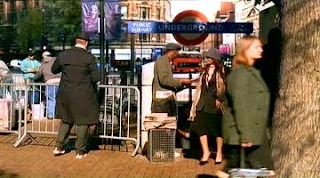 St James's Park and Hammersmith turned up in separate episodes of the firstseries of Between the Lines (1992 BBC1), while an as-yet-unidentified station was briefly seen in the background of one sketch in the second series of the wonderful Smack the Pony (2000 Channel 4). On Tuesday, with Claire to the Hammersmith Apollo for the "Steel City Tour" by the trio of Sheffield bands from my own youth comprising Heaven 17, ABC and - of course - the Human League. Inevitably, H17 opened, and although they proved my long-standing suspicion that I only knew a few of their tracks, there was a pleasingly nostalgic generic familiarity to the rest of their 40 minute set. Although they lacked Carol Kenyon's vocals on Temptation, Billie Godfrey was a more than adequate stand-in, ably assisted by Me'sha Bryan. ABC, on the other hand, had more familiar tracks, but they were never a group that registered much on my radar during the 1980s. There's nothing technically wrong with likes of Poison Arrow and The Look of Love, and Martyn Fry remains an accomplished performer, but our patience was stretched a bit by his 50 minutes on stage, which wasn't helped by the 40 minutes beforehand that it took to set-up after H17 had finished. Although quite a few people left after ABC's set, the auditorium seemed to refill during the next 30 minute stage-change, and there was a palpable air of restless expectation before the Human League's performance began with a gloriously sustained lead-in to Seconds, as the curtains that had been the rather plain backdrop to the previous two bands dropped to show the impressive set. Even though the League were on stage for over an hour - including encores - the sad aspect of having to share such a tour with other bands is that their set couldn't be as extensive as their solo tour in 2004. We got the old favourites like Love Action, Don't You Want Me? and Mirror Man, as well as the early more experimental Being Boiled and Empire State Human, but their later work was represented only by Tell Me When. This was a big disappointment, given that Susan Anne Sulley had a bad throat during the London leg of the 2004 tour, and so we didn't get One Man in My Heart. It would also have been great to hear live my all time favourite League track, Stay With Me Tonight, the stop-gap single between the Octopus and Secrets albums. As is often said about the League, every new single they have can hardly be described as a "come-back," since they've never really been again, but they have also kept pace with the time. The Secrets album in 2001 included All I Ever Wanted, which could certainly hold its own amongst contemporary dance music, but wasn't given the chance due to poor marketing and the (unconnected) collapse of the group's record company. Even with these caveats, though, an unmissable event, the tickets for which were a very welcome birthday present from Claire and her mother.